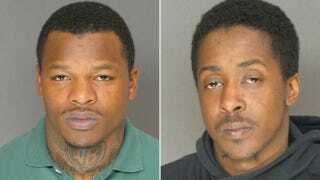 Baltimore police have arrested two men, 25-year-old Matt Brown and 30-year-old Anthony Leon Eley Jr., on human trafficking charges. Brown is the son of a prominent Baltimore attorney, and was an all-conference football player at Temple University. Three girls — ages 14, 16 and 17 — arrived at the hotel room and one of them asked for money, police said. All three girls were then taken into custody as victims of human trafficking. Detectives arrested two men who they said brought the girls to the hotel and knew they were underage and engaging in prostitution. Brown was a wide receiver, running back, and special teams standout on the Temple football team from 2009-2012. In 2012, he was named the Big East Conference's special teams player of the year, and was a coaches' selection for the All-Big East First Team. He signed a contract with the Tampa Bay Buccaneers in 2013, but was released before the season started.